I smell the blood. And even though he's a Scot, it could end up being PM Gordon Brown's. For he has chosen to put his trust in slippery FIFA chief Sepp Blatter and the promise that with a rule change in the world footballing body, England are in with a decent shout for the 2018 World Cup. In return, Brown says he will support investment in African soccer. That's good. So long as he doesn't think it's some kind of quid pro quo for guaranteed fair treatment. BBC1's alarming and well-researched 'Panorama' documentary about serious allegations of corruption at the very top of football (Monday, 22 October) would suggest otherwise. There are many arms to twist and shake yet. The determined silence of 'world football tsar' Seb Coe, who is supposed to root out this kind of thing, isn't encouraging, either. One of the few people with some credibility intact is former Scottish FA chair John McBeth (pictured), who has spoken out in spite of being traduced. Meanwhile, England's bid rolls on. Cue vast amounts of money being poured down drains or into pockets over the next few years. .... ouch! Methinks he's not in the for the job. Or Mourinho, in spite of the tabloid gossip. So that's Martin O'Neill, then. No one English is actually up to scratch, it seems. Meanwhile, as Alan Pattullo comments in The Scotsman: "The prospect of victory might be classed as slightly longer than a long shot, but Scotland at least know what they have to do when Italy visit Hampden Park next month. This is a blessing not offered the likes of England, who are required to sit and wait on others to supply a helpful nudge towards the Alps next summer." I felt quite lost last weekend. For the first time in six weeks, there was no obvious football match to go to. Bereft of action at St James’ Park after two good home wins (a hard-fought 1-0 against Grays and that six goal rollercoaster ride with Salisbury City), I found myself up in London and the Southeast on a work assignment. So while you were cheering England or Scotland on the telly, I was delivering a seminar in the wilds of Chichester. Strictly speaking I could have popped along to see Brentford on Friday night. But it was the other side of the town, I needed cheering up, the alarm was due to go off frighteningly early the next morning… and, well, Griffin Park isn’t exactly a theatre of dreams right now. More like a parking lot of gritted teeth. So I sent the Bees a quick good wish via my beer glass instead. Recognising that the grimmer realities of lower league football have not historically deterred me from hitting the turnstiles, I realise that the decisive factor in my decision to sit out Brentford’s 1-1 tie with Peterborough was the fact that I would have had to rush to the game straight from a meeting, probably arriving in my seat breathless and programmeless about 28 seconds before (or after) kick off. That’s definitely not how I like to do things. I may be almost late for everything else in life, but when I attend a football match I like plenty of time to get myself oriented beforehand and soak up the atmosphere when I arrive at the ground. Footballers are well known for their often bizarre pre-match routines. But we fans have our rituals too, and not just those (like our gallant Exeter stewards, club and Trust officials) who help to get everything prepared for the big occasion. In my case, getting ready for an afternoon with the Grecians is nothing too dramatic. But it feels very much part of the total ‘live football process’, nonetheless. After one or household activities, I like to settle down to BBC1’s Football Focus for my weekly dose of argument, comment and homely cliché. Then it’s on to the net to re-familiarise myself with the past week’s developments, drop into Exeweb (as a lurker rather than a participant) and generally get distracted from whatever else I could more usefully be doing. For some strange reason, I never have lunch before a football match, unless I’m meeting up with friends. Instead, my body seems to crave a big bag of citrus fruit and a flask of unfeasibly milky tea to sustain me through all those frantic goalmouth incidents. That and a choccie bar or bottle of Fair Trade orange juice from the EFC catering outlets. The people who sit near me must wonder what on earth’s going to come out of the bag and go down my neck next. Living in Heavitree, I need to allow about 20 minutes to walk to the ground. That means departing about 2pm, as I like to have time to pick up my copy of The Grecian, get to my seat in good time, catch up on the gossip … and commence my solo eat-a-thon. Something to do with concentration I think. If you need a Satsuma, just give me a nudge. After the game it’s a dash back for the results and analysis. Then there’s only four hours or so until Match of the Day. And they say football fans have a one-tracked mind. Go figure. I'm sure he's far too nice to laugh out loud - and he knows the players personally, so schadenfreude is out of the question. But behind that hand there must be just the slightest inner smile playing across Sven Goran Eriksson's soul this morning. England's retreat from Moscow means that they are relying on Israel to trip up Guus Hiddink's men now, and this is most unlikely. The beastly English media trashed the Swede for getting England into a succession of world quarter-finals. Now, under his successor (nowhere up to scratch, and treated with even greater vileness), the '66 hangovers will probably miss out on a major tournament for the first time since 1994. The whole situation is laden with irony. First off, the current (but not for much longer?) England coach has dropped 10 points in Group E. Eriksson qualified for three tournaments while letting 11 points slip over 24 games in all, as Kevin McCarra pointed out in the Guardian this morning. On top of that poor Steve McLaren has been tactically outwitted by his possible successor, Hiddink, who commented last night: "You could see in the first half that we had two strikers and they were playing with [newbie] Joleon Lescott rather inside as a central defender with Rio Ferdinand and Sol Campbell. So in the first half we had a lot of space on the right side and so we could penetrate there; although our attacking was not fine-tuned we still had that threat. That was why I changed it at half-time; they were vulnerable that side. And I like making [the left winger] Joe Cole a left full-back: you get rid of one of their attackers. That is why we could damage them." Then I have commented before how unjust and dumbass the anti-Sven, anti-'foreigner', Inger-landisms were. And the man himself has certainly done a good piece of advocacy for his talents at Manchester City. Well, now the England chickens have truly come home to roost by dropping the egg, committing unnecessary fouls (fowls, ouch!) and missing the bar. Bars are used to keep the hapless creatures penned up, right? Anyway, pathetic puns aside, it is more than possible that Britain will have no representatives at the European Championships - though my money is still on Scotland pulling off a shock against the Azzuri. I know, it makes no sense at all. And that's why it might just happen. Oh well, England may yet win a world cup again... but in rugby, which is a rubbish game and really doesn't count. (Sorry.) 'Mon Mandela! Since I care much more, I shall withhold an analysis of Scotland's failings last night. Except to say that they were five or six players down, too cautiously framed, weighed down by expectations and up against a sprightly Georgia side with nothing to lose and a reputation to develop. As we like to say when we have nothing further useful to contribute: "that's football". Now back to the studio. Och well, as my friends will be saying north of the border. But perhaps in a slightly more colourful fashion. I was hoping for a point from going to Georgia in the Euro 2008 qualifiers. But that would still have left Scotland needing a victory at Hampden over Italy. Beating the world champions? Nae bother. Thank goodness it isn't San Marino. "THE Board of Directors of Dumbarton Football Club is pleased to announce that agreement has been reached with Neil Rankine for the purchase of the majority shareholding in DFC. As part of the acquisition, agreement has been reached with A. Gemmell and D. MacIntyre, representatives of N. Rankine on the board, for the acquisition of their shares. 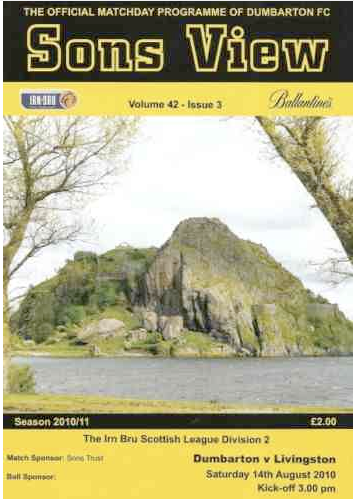 This secures the future and assets of Dumbarton Football Club. The acquisition will be made via a special purposes vehicle under the control of existing directors." Let's hope it enables the club, and the Trust, to move forward together. Hopefully to the second division in the near future. I'll drink to that. Right now, in fact, from my DFC mug - mine is an older, thinner one with stylish gold. Next up away to Elgin, then home to Arbroath. So here I am, watching Scotland's crucial Euro-qualifier away in Georgia on BBC2. The runes looked good, with England being dumped 2-1 by Russia. But as I write, we're 1-0 down and appearing pretty shaky - victims, too, of an appalling (non) penalty decision against magic McFadden. The irrational thought enters my mind that I'm a one-person bad luck conductor. It seems that every time I fail to witness Scotland (as with both France games), they win. But now that I am perched in front of the telly, swigging tea and chewing my nails... But now is not the time for negativity. 'Mon Scotland! 19.24: Oh woe, 2-0 to Georgia. This is too awful. But I did say that it was going to be an uphill task, and I didn't change my mind after the fantastic 3-1 win over Ukraine. 19.33: Beattie really should have got his header on target. Doesn't look like it's going to be our night, with 15 mins to go. Only one shot on target, and that from a dead-ball situation. 19.36: On the TV, former Scotland manager Craig Brown is reminding us that six first-team choices are injured. Which is true, but no comfort. 19.46: Three-and-a-half minutes to go. Well, that's it. G'night. As you settle down (or perhaps that should be ‘rev up’!) for another Exeter City home game here this evening at St James' Park, remember you’re not alone. And I’m not just talking about the people standing or sitting immediately beside you. Watching and playing football is a massive pastime. It has been estimated that 25% of the world’s population are football supporters. It’s not simply headline-grabbing clubs in search of a growing market for their merchandise who signal a continuing public curiosity. More importantly, research suggests that ever-increasing numbers of people are identifying with the game in one shape or other. That includes the young – as our own Red Army and junior set-up clearly shows. This in spite of the fact that school playing fields have been encroached on by developers in recent years, early attendance at live matches isn’t nearly as common as it used to be (a genuine concern I’ve mentioned before), and the media feed regular panics about kids obsessively glued to games consoles. But let’s look on the bright side. The Internet and gaming has been a major tool for reaching new generations. For many, it’s never been easier to watch clips, find the latest news, figure out skills and tactics on screen, join a fantasy league, follow your favourite teams, or link up with others who share the passion. Meanwhile, the English Schools’ Football Association champions a wide range of events, competitions and sponsorships. The FA’s ‘Get Into Football’ initiative targeted at young people involves 270 local development officers across the country. The pioneering Grassroots Football Show at Birmingham’s NEC has also been extended to three days (in 2008 it runs from 30 May to 1 June, if you have your diary to hand). This reminds us that it’s at park level that football really takes a decisive hold. And not just among boys. More and more girls are taking up the game, with the success of the Women’s World Cup in Beijing reinforcing that trend. This season, junior leagues with players aged between 11-14 in two year bands have been able to apply to their County FA to deploy up to four girls. Hopefully that will grow. The level and sophistication of interest has also changed dramatically over the past thirty years. When I was at school we had little tactical training, relatively few parents crossed the touchline, and until the age of nine or ten we tended to hunt the ball in packs rather than work in formation. 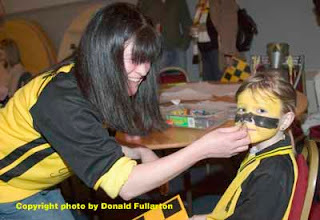 These days there are hundreds of thousands of volunteers engaged with junior football. Your neighbour could well be involved in youth coaching (the Association of Football Coaches welcomes teachers and junior coaches into membership, whether they have prior qualifications or not). The kids certainly know an awful lot more, too. The other week a friend was telling me about a conversation among alarmingly young school players concerning the comparative quality of their “movement off the ball”. Actually, movement off the ball was a skill I recall developing as a youngster, too. But not always deliberately. Things tended to go rapidly downhill once I had the thing at my feet. At least, that’s what my teammates figured. Perhaps that’s why they didn’t give it to me too much! Of course, not all is sunshine and light with football in the community. Equipment, admin and clothing costs have rocketed. Life is busy. Other distractions have mushroomed. But the ability of the game to capture the imagination at all levels and among people of all ages has not diminished. That’s why you’re here today. And win, draw or lose, you can help keep the momentum going. A combination of distance, modest income, and work and family commitments means that I’m a fairly rare visitor to the Strathclyde Homes Stadium at the moment. But last month I travelled the 364 miles separating Exeter and Dumbarton to support Raise the Rock… and, of course, to raise the roof for the Sons, who (conveniently for my September schedule) had two back-to-back games over seven days. In spite of the deflating result against Stenhousemuir, which highlighted the rocky footballing territory we are having to negotiate this season, everyone I spoke to thought it had been a great day. And 900+ through the turnstiles was a pretty creditable achievement, given the other events competing for local media attention that weekend. For me it was especially cheering to get together with Sonstrust members before and after the match – and to meet two other unexpected guests from England. Adam Anjoyeb and Ned West are students from Birmingham University who normally follow QPR, Aston Villa (and Manchester United – no one’s perfect!). But they’re also all round football fans who want to understand and experience the game at all levels. So they chose SHS for their first taste of fitba in Scotland, cannily figuring that Dumbarton’s hospitality package is exceptionally good value! That kind of interest and commitment is a sign of real hope. These days so many of the biggest football headlines are made by multi-millionaire owners, astronomic transfer fees and eye-watering wages for celebrity players. So it’s easy to forget where the game really belongs – in places like the Rock and with teams like Dumbarton. This is where football lives and breathes at its rawest, with all the joys and woes that brings. Remember how Hearts fans got carried away when what looked like the tooth fairy arrived at Tynecastle? Some of them didn’t endear themselves to other clubs with a rapidly acquired ‘high and mighty’ attitude, either. How fickle fortune turns out to be. That’s a saga with many twists and turns left in it, for sure. And many of them won’t have a lot to do with what happens on the park. As a fan of one of the logo-pushing giants you often feel sidelined by the powers shaping your dreams – little more than a statistic in an economic machine. In real terms, merchandising, sponsorship, advertising and TV deals dwarf the contribution of people going through the turnstiles. At a club like Dumbarton, however, you’re always a vital cog in the wheel. In an age of top-drawer sashaying at the really big fixtures, the embarrassing sight of empty seats gifted to people who’d rather be eating canapés than watching a goalmouth incident is also getting more and more common. The new Wembley comes to mind. I hardly need to point out that things are a little different here. The Strathclyde Homes Stadium has some fine facilities and offers some great value opportunities for corporate dos, business meetings, private gatherings, outdoor events, exhibitions and personal functions. The pre-match welcome from Sons fans is also fabulous. But these facilities aren’t just about the pounds (vital though those are to keeping the team on the road), they’re also about making everyone who comes into contact with SHS feel part of the long tradition and, we all hope, the long future of Dumbarton Football Club. So although I live many miles away and miss the regular match day contact, occasions like Raise the Rock are special for me, too. And just to remind myself of what it’s all about I also made a half-day pilgrimage to the Scottish Football History Museum at Hampden Park between Sons fixtures. There you’ll see, among other attractions, a Dumbarton players medal for the first ever outright Scottish League winners, donated by our own Jim McAllister and Graeme Robertson. It made me proud to be a Sons fan these past 38 years, and thankful for all those who make this fine club what it is. See you again soon, I hope. You don't know what you're doing? As the saying goes, ‘who’d be a referee?’ Before the whistle this afternoon, most fans and players would be united in agreement that keeping good order and fair play in a game as fast, passionate and heartily contested as football is an unenviable task. This, of course, is tosh. Even refs who have ‘a bad day at the office’ have spent hours getting on top of their craft, being monitored, watching play-backs and opening themselves to criticism. Yes, in the Blue Square Premier too. Of course, as with footballers, standards aren’t – with the best will in the world – exactly the same in the lower divisions as they are at the very highest levels. In particular, the reaction times needed to adjudicate a tight decision about a foul in a Champions League match (say) are minutely but decisively better. For many supporters, therein lies the problem. Outside St James’ Park we are used to watching officials like recent legend Pierluigi Collina ply their trade on TV, subject to inch-perfect analysis and playback. Even unconsciously, this is the yardstick we use to judge what happens at Exeter. I’m not defending poor practice in saying this. Occasionally, I too have thought that non-league officials would benefit from more scrutiny and support. But overall they do a pretty good job, and are as committed to keeping up standards as you and I. What doesn’t help sometimes is the attitude of players. That’s why FA chief executive Brian Barwick has recently announced plans to try to improve behaviour on the park, with one idea being to allow only captains to talk to the referee when a decision is being disputed. Personally I think the captain and one other player of his choosing might make more sense, since sometimes the skipper may not have been anywhere near the incident concerned. Furthermore, such restrictions shouldn’t interrupt the general flow of communication between officials and players during the game, which remains crucial. Commentators point out that both codes of rugby broadly work along this principle, and there’s no reason why it can’t take take root in football. Mr Barwick’s plans are to start at grass-roots level where many of the current problems have more impact. Abuse of referees has even led some to give up the game altogether. A number of high level managers and coaches admit privately (and some, like Steve McClaren, publicly), that standards of player discipline and respect for officials has been in decline since they came into the game. McClaren also told the BBC that he resigned as a president of a boys club because of some of the parents’ behaviour, reminding us that what happens on and off the pitch are not unrelated. Bear all this in mind the next time you hear someone yelling ‘cheat’ at the ref after a few decisions go the wrong way – something I’ve sadly noticed in ‘the polite seats’ at Exeter. Even when you have a perfect view of an offside decision from the stand (say), it’s incredibly difficult simultaneously to judge both the moment a ball was played and the exact position of the player targeted at one and the same time. So officials may not always get it right. But they do know what they’re doing. Which is more than can be said for at least some of us fiercely partisan fans, if we’re honest. It was inevitable, I guess. Today Exeter City's match day magazine, The Grecian, published a piece by me saying that we shouldn't give refs such a hard time. Predictably, therefore, the official at today's Grays game (City scraped a 1-0 win) gave, how shall I say, a less than stellar performance. Especially when he failed to act on what looked like a rather blatant last-man offence right near the end. Hey ho. I'll put up the article, together with the one that appeared in Sons View (Dumbarton disappointingly drew 0-0 against a poor Forfar side) on Monday 8 October 2007. Life has been busy since I returned from Scotland, so I haven't had a chance to say a proper online 'thanks' to the very, very fine people at the Sonstrust who made my two home games at SHS last month so enjoyable. OK, a scraped 1-1 against East Fife and a disappointing 1-2 defeat by Albion Rovers wasn't what any of us were wanting (1-0 last week away to Montrose was much more like it). But what a fabulous, friendly, enterprising spirit Dumbarton's small-and-perfectly-formed Trust has. Denise Currie (chair, pictured), Alan Findlay (secretary), Graeme Robertson (Sons View editor), Tommy Hughes (membership sec), Stephen Lynch (DFC director, commercial development) and the rest of the gang couldn't have made me - and anyone else passing through - more welcome. They all work remarkably hard to keep the Sons show on the road, and they do it for love not money. Well, that and a wee tipple or two.... :-) A special mention also to Club administration secretary Rowan Scott, who is charm itself. Life can be tough in the Irn Bru Scottish Football League Division 3, but DFC couldn't be in better hands. Next March I hit the big birthday five-o. Yup, I know. Hard to believe in one so young, isn't it? Hopefully a joint match sponsorship with the Trust will be my way of celebrating both a chronological landmark and 38 years of following the team. We're looking at the details and possibilities as I write. There's almost 350 miles separating Dumbarton and Exeter, but the Strathclyde Homes Stadium is the place to be. What an incredible few weeks it has been for that little regarded beast, Scottish football. From the national team' s second 1-0 victory against world beaters France at the Stade de France, right through to Aberdeen's progress into the lucrative group stages of the EUFA cup, courtesy of an unexpected elimination of Dnipro, it's hard not to feel buoyed. Meanwhile, Rangers have stunned commentators with victories against Lyon and Stuttgart, and Celtic defeated reigning European Champions AC Milan earlier this week. For me, the triumph of Aberdeen was especially sweet. It's many years since they and Dundee United were hailed as 'the New Firm' and seriously threatened the Celtic-Rangers duopoly. That night in 1983 when they beat Real Madrid 2-1 to claim the European Cup Winners' Cup will stay etched in my mind forever. Only a couple of weeks ago they were languishing near the foot of the SPL. 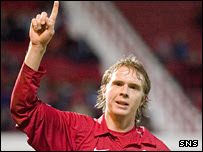 When Dnipro drew 0-0 at Pittodrie the Dons were written off as 2007 Euro contenders , following last season's significant third-place EUFA qualification achievement. Then Darren Mackie (pictured) turned the tables again with a 28 minute goal in Ukraine on Wednesday night. But Scottish football still has a long way to go. Celtic have had to learn very fast after their 0-2 Champions League humbling at the hands of Shakhtar Donetsk, which I witnessed in an embarrassingly quiet pub in Dunblane during my recent trip north of the border. (I was due to watch East Stirling take on Morton that night, but that's another story of unlikely all-ticket cup games). For Rangers the moment of truth will be when they face the might of Barcelona. We should take nothing away from their endeavours against Lyon, but the idea that the Scottish Premier League is better than the French League is pure fantasy. Scotland, too, have an uphill task to qualify for the European Championships, after heroics in the qualifiers so far. And Aberdeen will find the EUFA group stage mighty hard going. What's more, the game in Scotland still suffers from the top heavy weight of the Old Firm, vast economic and demographic disadvantages, and the undeserved disregard of the wider media. But this only makes this series of unexpected victories so inspiring. That plus a good bit of perspiration can push the Scottish game forward, no doubt. It'll be tough, though. Give dictatorship the Red Card (click on the pic) and kick out the Burmese junta. 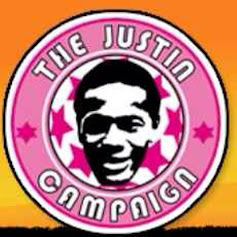 See also Amnesty off the park, about Dumbarton FC's support for a political prisoner and human rights.